It’s been a very classical couple of months in more ways than one. There was the expected lead up to Halloween. The arrival of new tables vying for the right to be called classic. 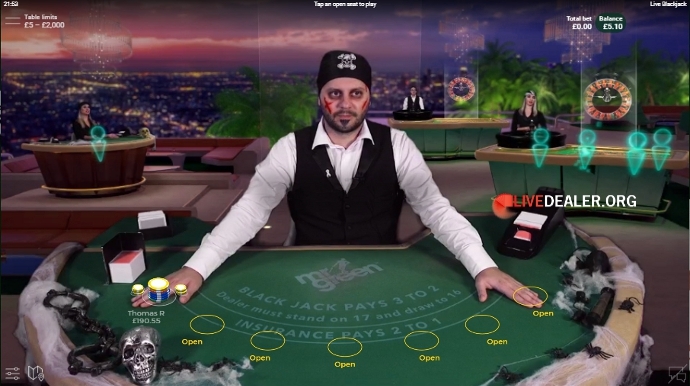 A new solution to a classic live blackjack problem. Throw in a couple extra ingredients, stir well in the promotion cauldron, hocus-pocus and voilà. After years of covering all the things going bump in the live casinos at the end of October it would be eerie not to cover a selection of them once again this year. Hardly the most traditional classic Halloween costume, but certainly my favourite was to be found courtesy of Evolution Gaming. 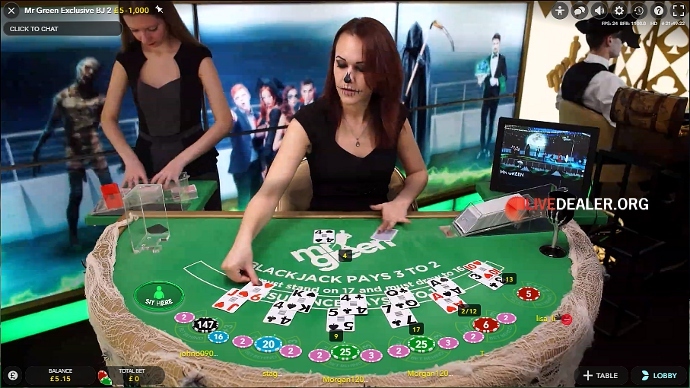 Total admiration to the dealer who managed to perform his blackjack duties wearing a green Orc monster costume at Grosvenor’s private tables in Malta. I think we can forgive any monster dealer for having to cut a couple of costume fingers off. 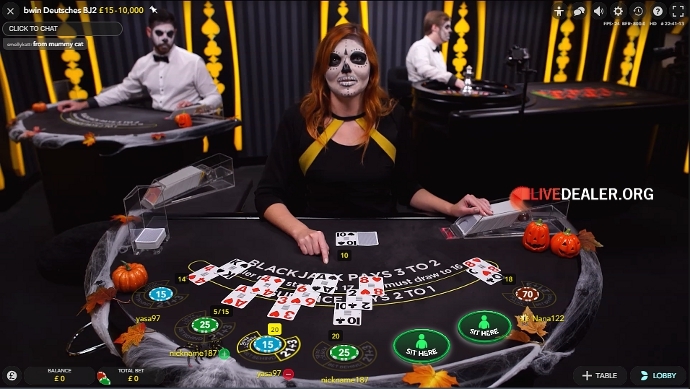 In regular attire, but also effective was the Day of the Dead makeup worn by Bwin dealers on its private black and yellow tables. Several casino private table areas (888, Unibet & Leo Vegas to name a few) had table trimmings and dealer costumes very similar to last year. Fortuitously for 888 casino one of their increasing in number, many private tables goes by the moniker CLASSIC, otherwise I wouldn’t even think a screen capture worth inclusion here. 888 also resurrected the “Elite ghosts”, no not a special breed of ghosts befitting a new generation of female ghostbusters. I’m referring to the apparitions floating across the Elite tables video screen backdrop wall. Even though a relatively simple touch, it was effective last year and so worthy of repeating again this year. Video wall imagery was also a Halloween mainstay at Mr Green private tables at Evolution’s Riga studio. Agast, there’s no such video wall behind one of Mr Green’s newest private table to open which is actually spirited away (I hope you’re getting all these seasonalesque references!) in the Georgia studio alongside a bunch of new CLASSIC tables. Shortly to be followed by more Georgia newness to materialize in November. I was disappointed not for the first instance, with what could have been, but wasn’t on display at Mr Green’s NetEnt powered Live Beyond Live tables. Specifically bearing in mind what should have been easily possible in terms of those background assets so readily boasted about at launch. Whilst video wall technology was a saving grace at some casinos, other casinos had diddly-“Sasquatch” when it came to costumes nor even the most basic of table trimmings. 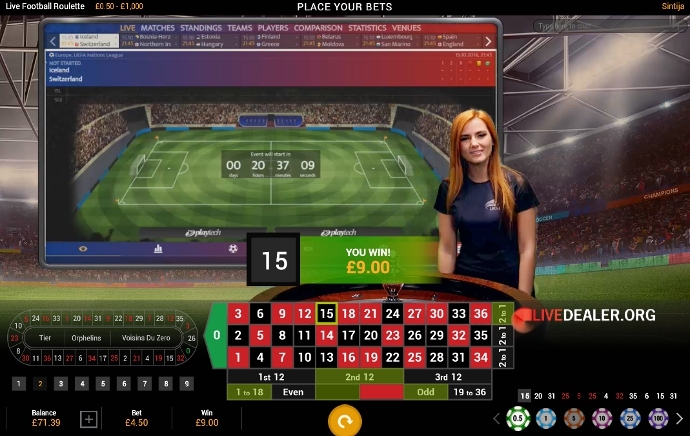 Of which several of the big casino brands seemingly either had other things on their mind (William Hill) or else Playtech powered (notably Paddy Power Betfair, Bet365, Sky). At Playtech the lack of all things Halloweeny wasn’t restricted to private tables, the Euro studio generic tables were also devoid of promotion trimmings compared with haunting recollections of yesteryear. But as I’ve mentioned ad nauseam in previous blogs this isn’t a chilling new phenomenon at the new Riga studio. Thankfully if you wanted some Halloween magic it wasn’t all flatlining at Playtech. 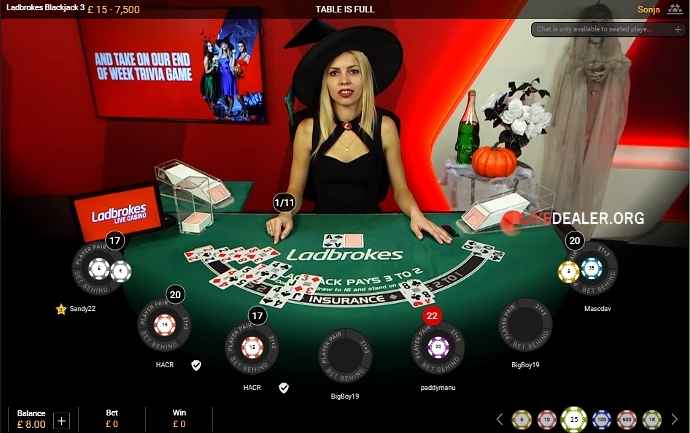 Group casinos Ladbrokes and Coral both unearthed some familiar looking trimmings and modified Playtech’s “classic” black dresses to inject some life into Halloween bonus cash promotions. 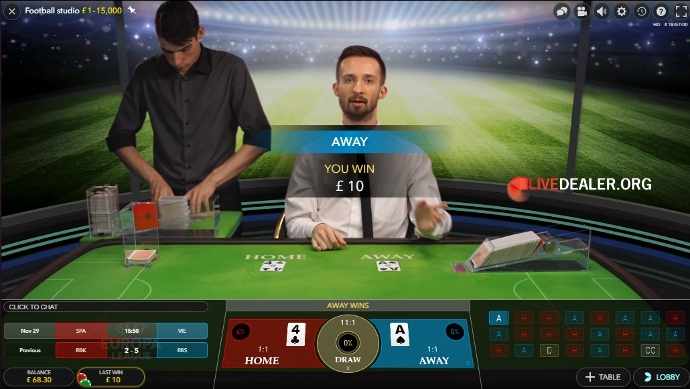 Also, on show also at Ladbrokes was the new Playtech blackjack interface that’s been developed as an alternative to the Mickey Mouse-esque look interface that was only rolled out last year. After I made the original Spider Senses Mickey comment I’m aware it was highlighted in a few other “melting pots” 😀 . 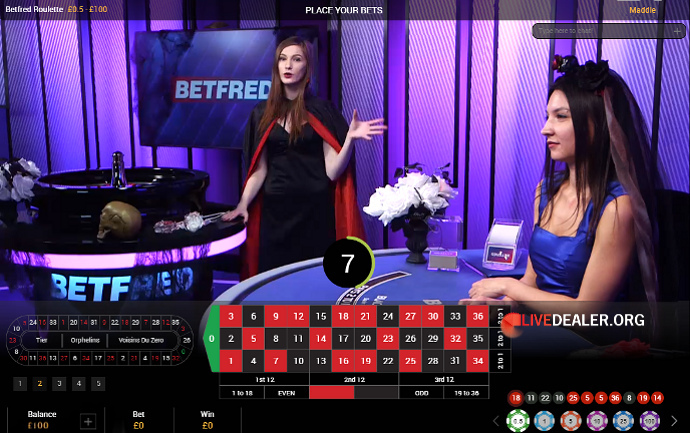 Betfred dealers donned Halloween capes and veils in the recently launched new private area at Playtech. 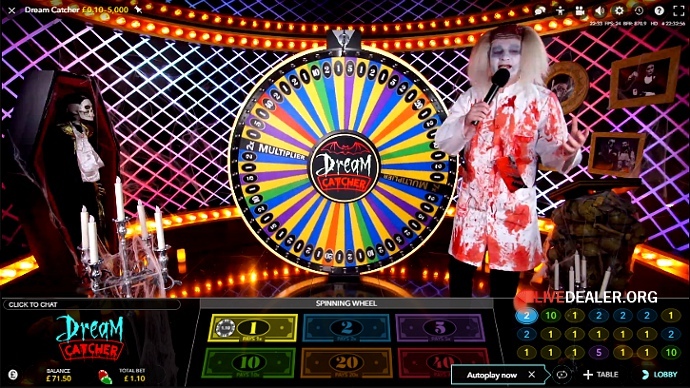 Best of all from Playtech, and my favorite live dealer game haunt over Halloween was a special themed general access Spin A Win wheel opened in addition to the regular wheel. Of all the Halloween Spin A Win trimmings I especially liked the animated video wall complete with dancing skeletons. That’s the sort of thing technology should be put use to, not horror stories like the frightful computer controlled wheel previously employed on Spin A Win when it was launched. 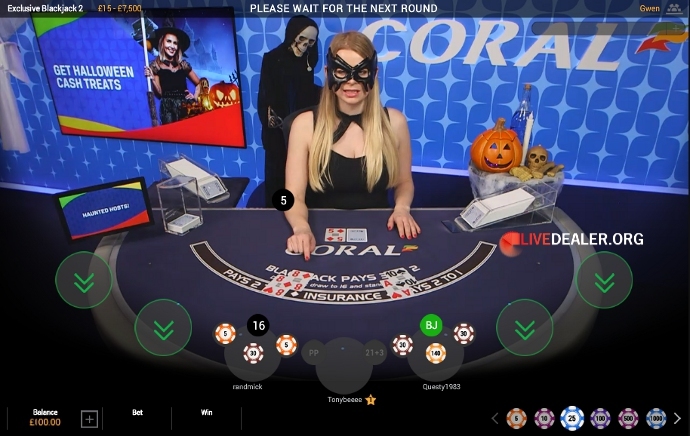 There was no need to use a orbuculum to see Playtech were just doing their normal thing in competing with Evolution’s Dream Catcher that looked so enchanting last year with the multitude of dealer costumes. This year Evolution added more decorations around Dream Catcher but to less overall effect than the Playtech offering. 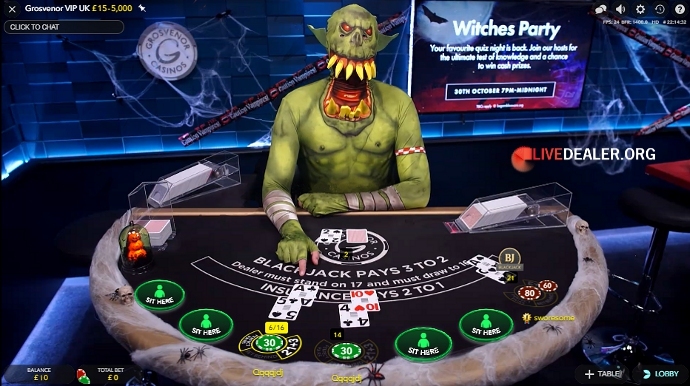 Just as the 2018 Halloween film is described as a re-imagining of the original film, think of William Hill’s new range of predominantly navy blue tables as a re-imaging of the old blue tables brought up to date for a 2018 player experience. Over Halloween the only missing ingredients were orange mood lighting, pumpkins, witches hat and it really would have felt like the old tables were back from the dead. Talking of which (in a fashion), rumor has it some old William Hill dealers are set to make a comeback, though not of the vintage of Jamie Lee. Enough flimsy silver screen word play and back to the main plot 🙄 .The new, internally referred to classic tables having replaced the closed private Macau and Mayfair tables. As I’ve said in the forums the modern era Mayfair tables styling didn’t appeal to me. I do like the return of a more traditional Hill look. Obviously the tables are in a new layout compared with the old, looking down a long corridor Mayfair of yesteryear, but otherwise do feel very reminiscent of the days when I first started playing at William Hill. If I was being picky I would say the new tables look too cramped together, but that’s nothing new with live dealer tables. That’s probably one reason subconsciously why I so liked the Macau tables as they were spaced out. Being more critical it’s a shame Hill have dispensed with private baccarat tables. For sure the tables felt like Silent Hill (shock! another frightful film/video game reference) much of the time to dealers with so few players, but again that’s nothing new. Besides which, I know some Hill dealers who liked dealing the variety of games that William Hill’s private tables used to encompass. The other major visual difference is the new William Hill dealer uniform. A change was probably long overdue considering it’s already a year since rival Paddy Power Betfair copied Hill’s uniform. In my opinion the new blue dresses look great, even if I’ve heard reports of players saying it’s too much blue everywhere. The alternative white blouse uniform that some dealers have elected to wear seem a tad ghastly compared with the old player’s favourite, spilling out of a gold corset look. If it was just for Halloween then g h o s t l y would’ve been okay, but they’re here to stay (for now) and I’d say there are better looking casino uniforms without being titillating or ghastly. As I mentioned earlier, Evolution have increased the number of shared Blackjack Classic tables. 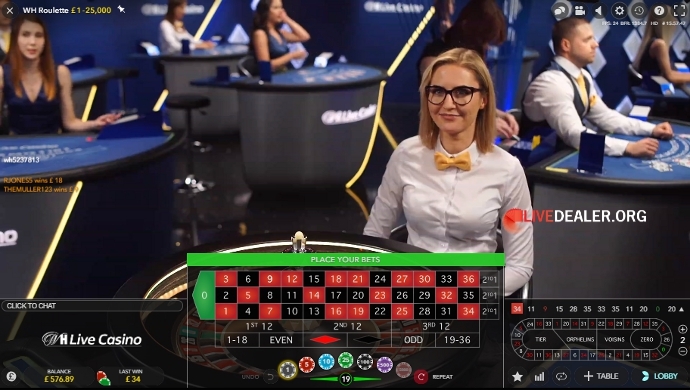 The new tables from the Georgia studio takes the current table count to 21 of these specific kind (as opposed to classics at William Hill/888…). 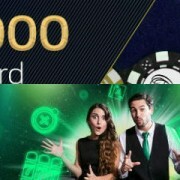 They are also available at a increasing selection of casinos including Leo Vegas, compared with previously when they were predominately at Mr Green gaming brands. Seemingly Evolution look to have tapped into something again with players liking modern looking tables whilst still evoking the feel of a classic traditional blackjack game. I for one am glad they’ve realized this before throwing the baby out with the bathwater in the rush to be different with a plethora of music blasting/Party/Disco/2 dealers/your dealer talks to anybody tables. 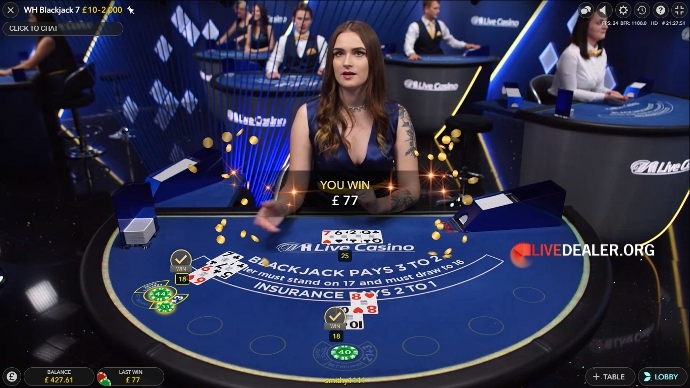 Although the Blackjack Classic tables aren’t currently available at William Hill it looks as though the upper echelons were like minded when it came to commissioning their own new range of classic private tables. And in the fullness of time after buying Mr Green & Co, William Hill could well have more “classic” tables than dealers….almost 😀 . Long after the this year’s World Cup tournament ended, football themed live dealer tables have remained open. With studio based tables proving popular enough to keep running now geared to focusing on European and domestic (Premier League) matches. 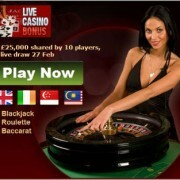 At Playtech it’s roulette that keeps the beautiful game passion burning up to and during matches. The regular use of female dealers makes for an attractive distraction when your favored team’s performance isn’t the best example of the beautiful game personified. To boot (yes! managed to slide a football gag in), credit where it’s due Playtech, have actually managed to unearth a few female dealers with some football knowledge and who’ve even attended a real big club match – paid for by Playtech with the proceeds of dealer tips naturally, reputedly, only joking, maybe possibly varbūt 😛 . At Evolution the Football Studio table based on Dragon Tiger (albeit with minor Ace is high difference) remains a testosterone zone with male dealers, open 7 days a week. As you’d rightly expect there’s a greater depth of dealer football knowledge and chat to be had at the Football Studio table. 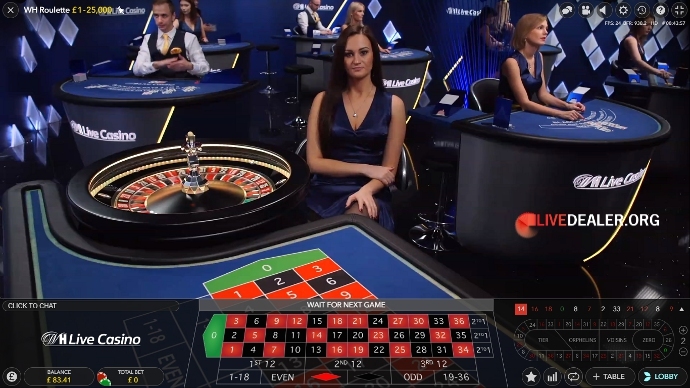 Although the live casino game itself isn’t likely to hold your attention for so long as Playtech’s more feminine beautiful offering and more “exciting” roulette game, unless betting on the toss of a coin figuratively is your thing. Whichever, single or multiple, private tables are on the increase at the dealer studios. 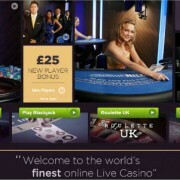 No, I’m not referring just to tables belonging to a single casino (we’ve watched that phenomenon for years here at Livedealer.org), nor those shared among a casino group, of which we’ve seen a big increase over the last couple of years and for sure many to come with more mergers/takeovers. More specifically those tables which exclude players on other grounds such as account balance or are truly private in the original sense in that you are the only player and other players don’t even get to bet behind, sit behind, watch, nada! 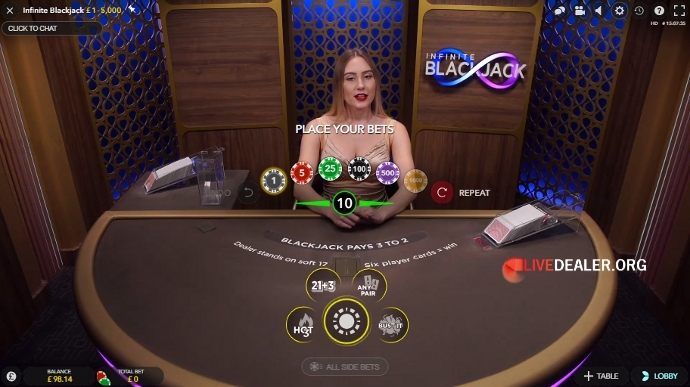 As you might expect Evolution Gaming had more of these alternatives covered once they opened the Salon Privé Blackjack and Roulette tables at the start at 2018 and more recently Salon Privé Baccarat. Having established the Salon Privé concept it was really only a matter of time before the bigger Evolution casino brands jumped on board and opened their own exclusive private Privé tables. 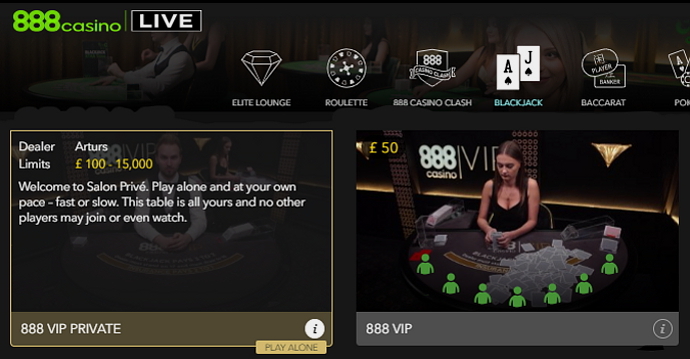 If private Privé may seem like a form of word reduplication it’s probably just simpler to say that 888 casino now have a Salon Privé table in their VIP table area. With Mr Green having followed suit early November with the opening of a private Club Royal, for your eyes only exclusive play (a la Salon Privé) table of their own at Evolution. It’s certainly a trend I expect we’ll see more of from Evolution casinos in 2019. In comparison to Evolution, Playtech have adopted a much more liberal interpretation of the word privé where it now appears to be the new word for that overused and abused word “exclusive“. Where just about anybody and everybody can join the tables and at the same time. Admittedly Playtech’s Soiree tables don’t make mention of the word privé, but I’d contest that they are are trying to appeal to a similar type of player as to the Salon Privé tables at Evolution. Further to which there’s a set of 3 Playtech blackjack tables which do indeed go by the name Privée. 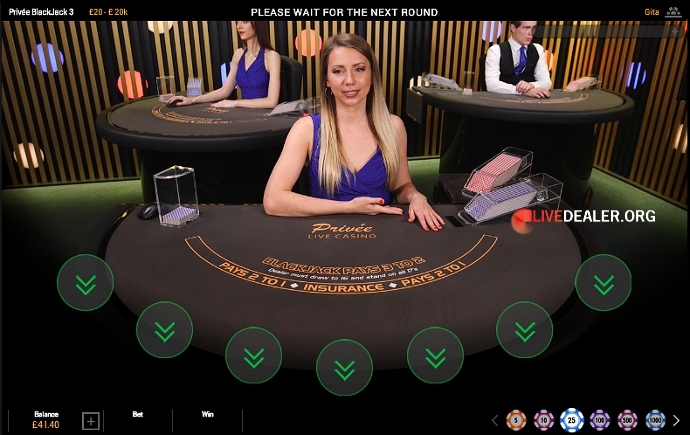 The new Privée tables are actually shared tables among group casinos Ladbrokes, Coral and Gala. At the same time Gala’s distinctive, new for 2017 neoplasticism look private tables having closed. They almost look good enough to compete with what’s out there nowadays, but still in my opinion not as good as the old Gala private table looked in its swish heyday. Considerably more disturbing, I don’t know how they have the nerve to call them Privée/private with the amount of background noise. It can’t be just a bugbear of mine that I pick up on so often, especially at supposedly more “select” tables at Playtech time after time, old and new studio, can it? More was what we’ve had from Evolution, but only an increase to the number of blackjack tables month in, month out, coupled with an increasing number of studio locale. That was until October’s spider revelation of something imminent about to occur. Perfectly on cue, just before Halloween Evolution conjured up (minus spiders) INFINITE BLACKJACK, their long awaited response to what I’d been wishing for so long. Oh, boy! 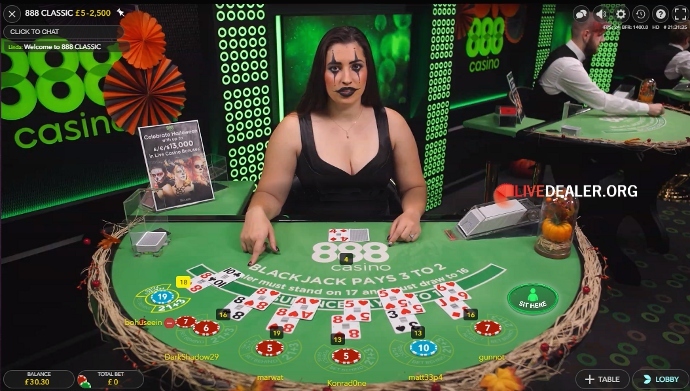 it looks like they’ve got all the essential ingredients for the new blackjack table to be a spellbinding success for a good few Halloween to come. In case it wasn’t obvious already, yes! I like the new infinite table. It’s not perfect, but then no unlimited number of players, one deal to many format blackjack table is going to be free of gripes from players about other players hitting when they should stick, accusations of casino opportunities for cheating and so on. 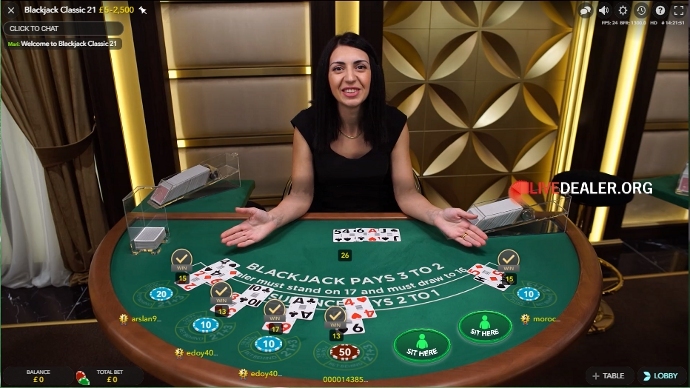 LD’s review of Infinite Blackjack does the customary exemplary job with all the details including new side bets and the clever solution Evolution have employed to deal with an old conundrum. Aesthetically it may not the best looking table ever from Evolution, although it’s a hard ask for Evolution to keep outdoing itself with every new table. 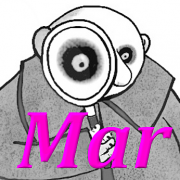 Of course most players don’t prioritize looks over other benefits. One extra rare live table ingredient that’s bound to attract players from regular tables is the Six Card Charlie rule. Whereby if you draw 6 cards without busting, including splits it beats whatever the dealer has including blackjack 😎 . So far I’ve not had a noteworthy win thanks to this extra game rule dimension on Infinite Blackjack but I’ll keep trying. The resulting higher RTP for the game (99.47%) is most welcome!